There have been reports of some text messages that appear as though they are being sent from Fr. Dave that are similar to the e-mails that were going out. 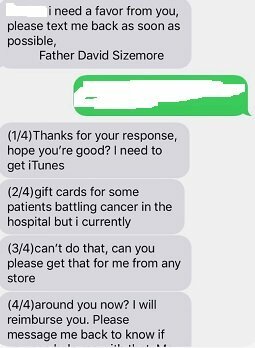 If you see any text messages asking you to buy i-tunes card or other gift cards on his behalf for someone, or with text similar to "I need a favor from you, please text me back as soon as possible. Hope to hear from you soon. ", or "I need to get a Google play gift card for some patient battling cancer at the hospital but I currently can't do this. Can you please get that for me from any store around you now? i'll pay you back. Let me know if you can get the cards for me", please disregard as the requests are fraudulent. If you have any questions or concerns, please contact Dave Stenson (dstenson@stfrancisparish.net 740.345.9874 x.237). Thanks.